There are many factors to consider when choosing the right plan for you. Age, contribution and deferral capability, company status (sole proprietor or owner), tax position, age you wish to retire, and whether or not you have common-law employees are all considerations when choosing the right plan. Regardless of which plan you choose, Advanta IRA clients can invest in numerous options beyond traditional stocks, bonds, and mutual funds. You can invest in alternative assets that you know and understand in order to fully maximize your earning potential. Because of the complexity of many investment options, you should consult a financial expert when investing in areas beyond your own expertise. It is important to be familiar and comfortable with the investments you choose before making decisions. Your IRA forms an LLC and is the single member and only owner of the LLC. The IRA owner is designated as the LLC manager and opens a bank account in the name of the LLC, funding the account from money out of the IRA. The manager can sign all LLC documents and has the critical responsibility of keeping accurate records and maintenance of the account. The manager also has checkbook control of the account and can write checks to purchase investments and to pay expenses directly related to any asset owned by the account. Although some financial institutions may declare their IRA-LLC has been approved by the IRS, the checkbook-control investment option has not been confirmed by the IRS as an acceptable arrangement under the terms outlined IRC Section 4975. It is questionable whether the IRA owner and acting manager of an LLC, owned by the IRA, constitutes a prohibited transaction, and, to date, the IRS has not completely resolved this issue. 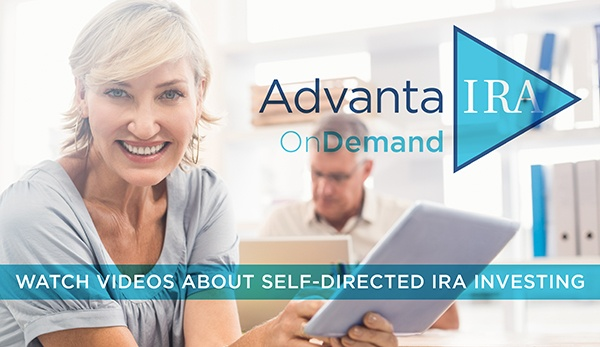 Advanta IRA does allow an individual to invest using a checkbook IRA/single-member LLC, but requires the IRA owner to sign an indemnity agreement before the transaction is made. These investing structures are also known as single-member LLCs and checkbook control IRAs. We always advise the investor to perform thorough research and to seek the advice of a tax attorney or financial professional prior to choosing to form and use a checkbook IRA. A rollover involves the movement of funds from an employer-sponsored plan to an IRA account and is initiated by the client personally (i.e., moving funds from an old 401(k) to an IRA). Rollovers can be done from 401(k), 403(b), and 457 plans, Thrift Savings Plans, and pension plans. A transfer involves moving funds directly from one IRA (or account) to another whereby the receiving trustee sends the request to the resigning custodian. For someone starting an Advanta IRA account, we would submit a transfer request on your behalf to your current custodian. Both transferring funds and rolling over funds into a new Advanta IRA do not result in any tax consequences. No. The point of self-direction is that you can buy real estate, including rental properties, mortgages and notes, private stock, foreign exchange, precious metals, and a myriad of other alternative investments that extend far beyond the limitations of the stock market. Alternative investments are those that are not the typical stock, bond, or mutual fund offered by mainstream brokerages or banks. Every administrator chooses which types of investments they allow. Advanta IRA, as a self-directed plan custodian, allows clients to use alternative assets they are familiar with to build wealth for retirement. **This list is not comprehensive. There are many diverse investments permissible in self-directed plans. Advanta IRA does not promote any particular investment products. Please consult an accountant or other financial professional for information regarding your own permissible investment opportunities. What types of investments are not permissible in my self-directed IRA? Life insurance and collectibles are restricted items pursuant to IRS Code 4975. Collectibles include: antiques, works of art, metals (with the exception of gold, silver and palladium bullion), rugs, gems, stamps, coins, alcoholic beverages, and other tangible items of personal property as defined by the Secretary of Treasury. IRC 4975 also defines disqualified persons as those persons and entities are prohibited from doing business with your IRA. Yes, this is permissible but can be a little tricky. IRS rules regarding companies taxed as an S-Corporation are forbidden from having IRAs as owners. Investments into C-Corporations are certainly possible, as are investments into companies taxed as a partnership. However, if you or a disqualified person for your IRA (your spouse, lineal ascendants and descendants) are involved in the management of that private or start-up company, then there could be other prohibitions as well. For more information on investing in a private or start-up company, please call us. We also encourage you to consult a financial professional (like an accountant or CPA) or see IRS Code 4975. No. Making repairs yourself is considered “sweat equity.” While difficult to quantify, sweat equity is prohibited because all contributions to an IRA must be in cash. You are required to use funds from the IRA to pay a third party to perform repairs. You, along with other disqualified persons or entities, are prohibited from receiving any personal income or benefit from an asset in the IRA. Who is a disqualified person or entity? Note: Siblings are not on the list of disqualified persons. This list not a full list of disqualified persons or entities. Please seek the advice of a financial professional for advice regarding disqualified persons and entities.